APJ Digital Commercial Service – In today’s world, lifestyle technologies for the workplace have become more complex but offer a vast new range of solutions. APJ Digital aim is to help our commercial customers understand these new products and how they can improve comfort, health, safety and overall quality of life inside at the commercial workplace. At APJ Digital it is our mission to provide you with nothing less than 100% customer satisfaction. Our experienced engineers are ready to assist you, whether you require a new digital aerial upgrade, DAB radio aerials, satellite installation, extra TV outlets or just friendly advice. Why not control your digital box from another office? With the aid of an infra-red ‘magic eye’ you can change channels, operate interactive functions and play, pause and record those channels – what more could you possibly want? 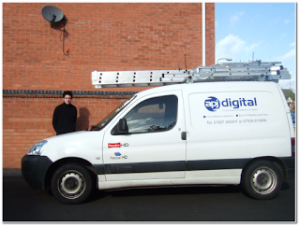 At APJ Digital we specialise in Commercial aerial installation, repairs and upgrades making your television experience a better one. If you are having problems with your current commercial satellite reception, call us. Our professional installers are experts in servicing and repairing TV aerial issues as they understand the importance of having the best working signal at your commercial property for your Digital, TV signal; SKY or Freeview box. Why choose APJ Digital over any other company? Well, simple, we promise to meet all your aerial and satellite needs and specifications, be cost effective and, above all, we are good at what we do and deliver what we say we will. Please call APJ Digital on 0800-4332285 to explore the myriad of digital broadcasting channels and the whole new world of interactive viewing services.